Carrying eyes around on a plate is not an everyday occurrence, but it happens twice a year in Syracuse, Sicily during the Festa of Santa Lucia, December 13 and May 13. 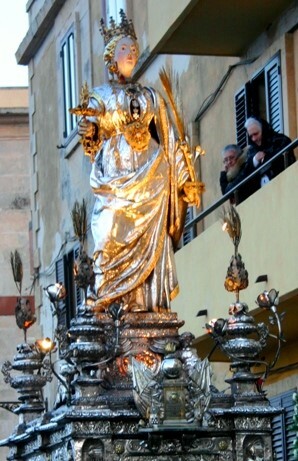 During the Festa, the statue of Santa Lucia is carried through the streets of Syracuse, no mean feat considering that the statue alone is made of 90 kilos of silver, and it stands on a huge base of carved silver – no wonder it takes 60 men to carry it. But back to those eyes on a plate. Several versions of Lucia’s martyrdom are told, including having her eyes gouged out by Diocletian soldiers when she refused to renounce her Christian faith, or even tearing her own eyes out in a rather overly dramatic gesture of her dedication to Christ. 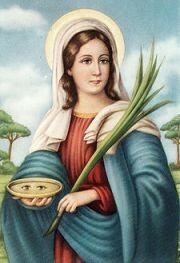 Therefore, Santa Lucia is commonly depicted with the symbol of her eyes on a plate. Syracuse’s splendid statue of Lucia is no exception. Lucia’s right hand holds a plate, offering her eyes to God. The name Lucia comes from the word luce – light. She is the protector of eyesight, the patron saint of Syracuse, of ophthalmologists and electricians, and of the blind. The Festa of Santa Lucia begins with the statue being carried out of the Duomo on the shoulders of the berretti verdi – green berets – accompanied by a raucous display of fireworks. The procession becomes solemn as it slowly winds along the waterfront and through the city until dusk, when the statue is carried into the Church of Santa Lucia, where it remains for 8 days. On December 20, traditionally the shortest day of the year with the least luce, the statue is carried ack to the Duomo in another procession, and locked away until the following May.